Digital Ultraviolet and Digital Copy will makes it possible for you to stream the movie Midnight Sun UV or iTunes Code Via MA instantly to your computer and compatible Smartphones, Andriod, iphone, iPod Touch, iPad and tablets devices anytime, anywhere. 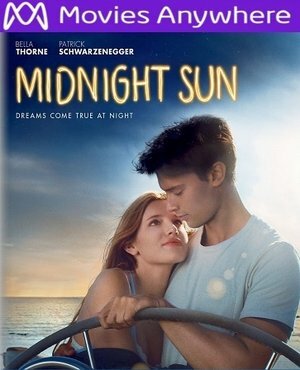 You can also download a Digital Ultraviolet Copy or a Digital Copy of the movie Midnight Sun UV or iTunes Code Via MA to your computer and compatible devices. 17-year-old Katie Price (Bella Thorne) has been sheltered since childhood with a rare disease that makes even the smallest amount of sunlight deadly. During the day she is housebound, but after nightfall, Katie can venture out to the local train station and play her guitar for travelers. One night, her dreams come true when she's noticed by Charlie (Patrick Schwarzenegger), whom she has secretly admired for years, and decides to hide her condition from him as the two embark on a uniquely powerful romance over one nearly perfect summer.